Do not be fooled by the cast list. Neither Lance Henricksen or Michael J. Nelson had anything to do with this movie. I do appreciate the 1970s style title. Anthology movies are always hit or miss. There are only so many minutes in a movie, and each additional story splits the available pot with which to tell a story. Many deal with this by having only about four stories. This allows them to be roughly the length of a half-hour commercial TV episode. Some, like The ABCs of Death , embrace the brevity and present as many thoughts as possible in the hopes that the scattergun will hit. Then too, most have a wrapping narrative to connect the segments. These can be as simple as each title starting with the next letter in the alphabet or as intertwined with the stories as Peter Cushing selling cursed items from his antiques shop. The high concept for Summer School is that a kid falls asleep in an empty classroom, where he keeps waking up from one scary dream into the next. His name is Charles (Simon Wallace), and he has apparently binge-watched a bunch of horror movies for his review site. As the title suggests, he seems to have come to school for a summer class — Physics, if the dreams aren’t lying about non-horror facts. Every story centers on Charles and involve some or all of the pool of school characters: a few close friends, a girl he fancies, the teacher, the security guard, and the nameless fodder that fill out the cast roster. There are seven stories (including the wrapper), and altogether Charles wakes up no fewer than 9 times. This is playing with the difficulty set on Hard. Four experienced and talented directors teamed up to make Four Rooms with a shared character and setting, and it did so well that it’s never spoken of. Five directors — including Orson Welles — and a legion of largely uncredited writers worked on the endearing fiasco that was the 1967 anthology film version of Casino Royale . What I’m saying is that five directors working on seven stories with the same characters and setting is ambitious, particularly when the “it’s yet another dream” premise removes any and all emotional investment in Charles’ adventures. Dennis (Lance Hendrickson) stops Charles from questioning events. So I give the many directors and writers of Summer School credit for reaching too high, while acknowledging that the result of their collective effort is not very good. On average each story only had 12 minutes to work with, so the majority of the scenarios are fairly trite without much room to stand out in any way. There are still some fun moments; the segment “Vampires” features an entertainingly improbable staking, and “Slasher” sees Charles finally snap and go on a stabbing spree. Largely though, it’s a collection of genre beats without any context or weight. Perhaps the worst section is the one that the greatest chance to break free of the limiting nature of the setup. “Hill Billy”, written and directed by Mike P. Nelson, puts a backwoods redneck family living directly outside the school. It’s the most overtly dreamlike setting detail in the film, and it gets us out of the building, so it’s a promising start. Sadly, all we get is recycled homosexual hick panic with a predator played by an actor too scared to actually touch Charles. It’s… not good, and the double-fake end of the segment does nothing to clear the air. So why am I even reviewing Summer School then? Because, dear readers, the second interior story contains that most rare and horrible of arachnids: spider men! 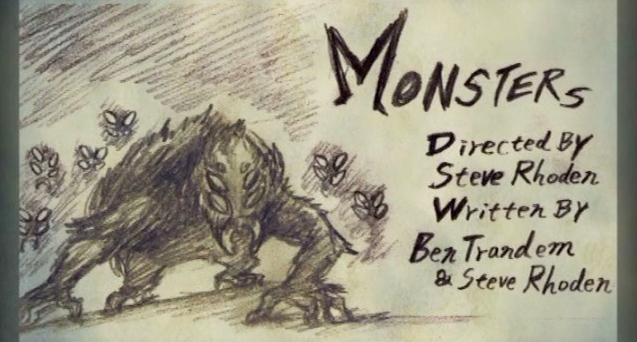 The segment “Monsters” is co-written by Steve Rhoden and Ben Trandem (who had a writing and/or directing hand in all but two of the stories) and directed by Rhoden. It’s my favorite part for two reasons. First, of course, is that it features arachnothropes. That’s a word I just made up, because a cursory search turned up nothing else that fit. There’s zoanthropy, but even if you ignore the fact that it’s intended meaning is for people who only think they’re animals, it’s still usually restricted to mammals. Not a lot of people think they’re creepy crawlies, apparently. 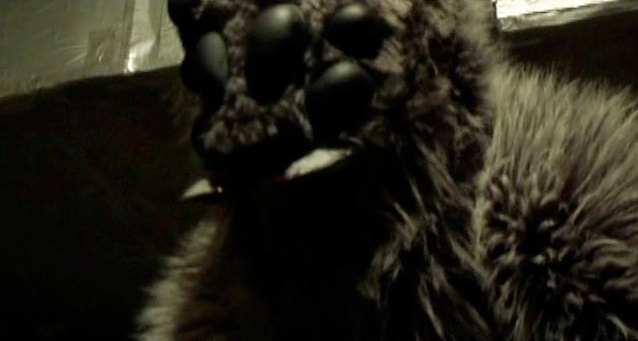 The other reason I like “Monsters” is that it chose to avoid cliché. Sure, there’s nothing too unusual about infectious monsters, cocooned victims, or going down in a swarm, but instead of trotting out werewolves or making giant spider puppets someone thought “You know what? Spider masks would look sweet with gorilla suits”. I love that kind of thinking! The overall effect was rather silly, but I have to say that the masks look good. They’re only seen in quick shots or at a distance, so they come off well even with their immobility. Plus, how many times have arachnothropes appeared on film? Without poring over my notes on spider movies I can only come up with three: Horrors of Spider Island , Curse of the Black Widow , and the execrable Lost in Space . I’d also accept Mesa of Lost Women , although none of the humans looked spidery, and the spider just got big. I’m not prepared to discuss Mari-Cookie and the Killer Tarantula . It’s still too soon. Okay, and there are a few adaptations of Monkey that have spider women… My point is that it’s fun to see such an underexposed monster type in a movie that’s otherwise merely a tour of familiar scares. I mean, they even hauled out Nazis, for crying out loud. It’s got them crazy eyes! Overall, Summer School does little more than prove the technical competency of the filmmakers. That’s not a knock. While I was generally unengaged with the movie, I couldn’t fault the production values. The camera work, lighting, most of the sound, and even the effects are well above average for such a low-budget project. This kind of showpiece can be a nice entry on a CV, and indeed many of the film’s workers have since worked on technical and makeup capacities on TV, including some directing. Not bad. This review is part of the Adult Onset Lycanthropy roundtable; we’re taking a look at films were people become inhuman. The links below are for reviews from other participants. Give ’em the ol’ clicky, would’ja?